It's May and there are flurries... flurries that quickly appear to be developing into a full-on storm. This is unusual. While snowfall of any amount at this point in the year would be abnormal, I'm not referring to fluffy flakes of powder. Rather, in this case, what is storming the city of Chicago is a flurry of roster moves. In Tuesday's post, I detailed how the Cubs have had to call upon the services of several minor league call-ups to fill in for injured regulars. Meanwhile, this has added an assortment of new names to chase for my Cubs All-Time Roster Collection because, of course, none of these fresh faces have much of a cardboard footprint. I must admit, it's been somewhat frustrating. 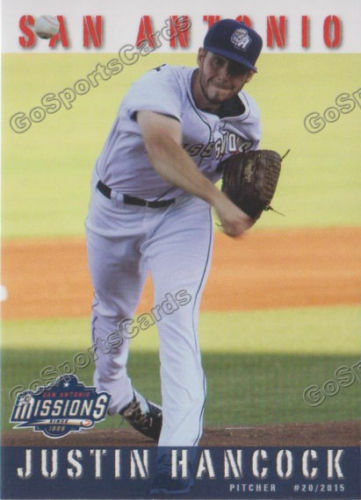 Speaking of Tuesday, in that post I detailed the circumstances surrounding the call-up of Cory Mazzoni and showed off the Topps Now-inspired custom card that I whipped up to commemorate the occasion. Still needing an actual card to fill his newly created gap in my collection, I used my lunch break yesterday to stop by my LCS, which is conveniently (and dangerously) located near my place of employment. While there, I was irrationally overjoyed to come across this dual-rookie card from 2015 Update in the shop's random Padres box. This LCS has a small, plastic box for every team in the league, crammed with an assortment of cards from the last decade and a half - to say they've come in handy with my roster jenga collection would be an understatement! Of course, while I still have yet to acquire cards of Efren Navarro, David Bote, or Luke Farrell, checking Mazzoni off of my rapidly-swelling "needs" list alleviated some frustration. That said, since I clicked publish on Tuesday, Mazzoni has already been demoted to AAA, after just one appearance. Rob Zastryzny came up, along with Jen-Ho Tseng to replace a concussed Jason Heyward and a sick Yu Darvish. Thankfully, these names already appear in my CATRC binder, having debuted in years previous. I felt as though I had re-gained a little bit of lost ground in picking up Mazzoni. The powers that be must have sensed my placation and, proving that I just can't keep up in the rat race, another series of roster moves was announced shortly before my lunch break trip. Swapping Z's, outfielder Mark Zagunis took Zastryzny's spot on the 25-man, while yesterday's sport-starter Tseng gave way to another fresh armed relief prospect, Justin Hancock. I've had Zags in my CATRC binder since last summer, after he made his MLB debut in June; however, this will be Hancock's first cuppacoffee. Owing to the fact that he's never appeared in a mainstream set, I do not have a card in queue for the latter. Womp, womp. Like I said, I don't have any cards of the prospect because his options are extremely limited, as the borrowed scan above attests. 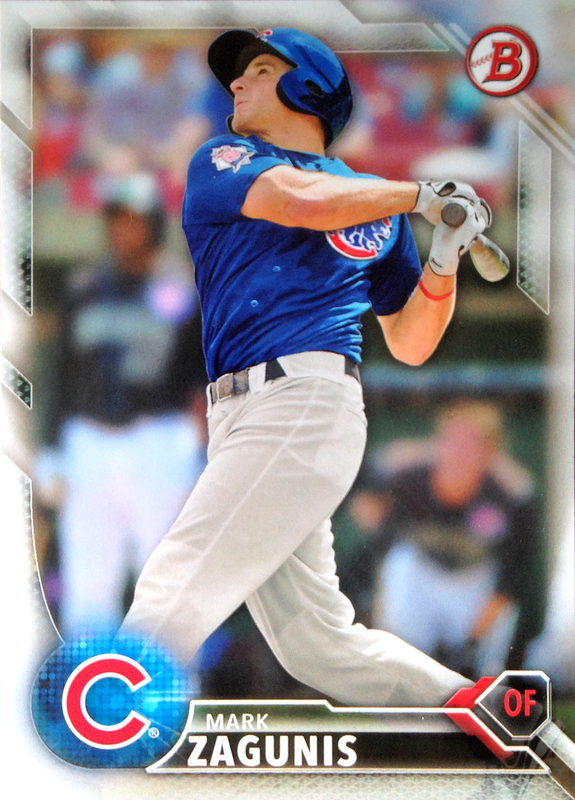 Never a blue-chipper, Hancock has never appeared in a Bowman, Contenders, Pro Debut, Onyx, Leaf or any other prospect-laden product. For me, the only options are his minor league, team-issued singles, which are usually annoyingly over-priced on the secondhand market... harumph. I should mention that the former Padres moundsman was acquired from San Diego in the Matt Szczur swap, which was consummated just barely over a year ago. After a conversion to the bullpen, the fringe prospect's stock rapidly rose, as did his readings on the radar gun. Topping out around 98 mph, Justin has struck out 58 in 52 innings of work since joining the Cubs organization, though his secondary pitches may still need some refining and his control is suspect. It's easy to dream on his arm, but we'll see if his stuff translates to the Big League level. Back on the card front, after a quick Ebay scan, it looks like I'll only be losing more ground for the time being. I'm not paying twice the value of the card on shipping alone. Speaking of falling behind, I'm not only lagging in terms of roster additions, I'm also struggling to keep up with new products hitting the market. I usually like to sample at least one pack per product as the baseball season progresses; however, so far in 2018, the only newfangled card stuff that I've ripped is a single pack of Series One. All I can say is that life has been busy and I've had much more important things to deal with than checking the card release calendar. So, with that in mind, I decided to grab a pack of the much-ballyhooed Bowman as I completed my lunch-time LCS trip. Well, it was mostly because I needed something to get my purchase up over five dollars, seeing as I didn't have any cash in my wallet and the shop keep has a minimum requirement for debit card use. But, who knows, maybe there's one of those Ohtani's in there just waiting to make me flush with greenbacks! That Shohei guy is exciting and all, but that autograph that I'm really chasing in this product is aforementioned Cubs prospect, David Bote - one of the previous call-ups that I've fallen behind on. The late-bloomer, like Hancock, has never been deemed worthy of a Bowman card... that is until this season. Of course, he vaulted over for the base set and was placed solely into the autograph section. A "hit" in an already scarce and over-priced/valued product...why must you do this to me, Topps? Not too much to write home about here, although no one buys Bowman for the Big Leaguers. The sight of Evan Longoria in Giants orange is still surprisingly jarring. Is that because orange is naturally distracting color or due to the fact that Evan is the only Tampa Bay Ray anyone could name before this season. You decide. Oh hey, Hunter Harvey - I recognize that name. The embattled former first-rounder was called up to the Bigs early this season for the first time... and then promptly optioned back to AA before making even a single appearance. Will the Oriole farmhand make it back up to the Majors again, or will he be relegated to haunting the footnotes of Major League history as a "ghost?" Only time will tell. As for the other guys, Andres Gimenez is considered one of the best international rookies to come out of the 2015-16 free agent class and is a 19 year old in High A. Of course, he's a Mets prospect, so they'll probably break him. Meanwhile, Merandy Gonzalez is yet another Marlins card that I'll have until the day that I die. Chrome prospects. Cal Quantrill is a name that's familiar to me, both because I'm vaguely aware of his high standing in the Padres chain and because his father, Paul, played in the Bigs not too long ago... at least, that's what I thought, anyway. I suddenly feel very old, as Baseball Reference just informed me that Paul Quantrill last donned an MLB jersey 13 years ago... egad. How is 2005 almost a decade and a half ago? And, finally, the insert. Was it a super mega valuable Shohei Ohtani? A David "Bote McBoatface" signature? So, there you have it, my dalliance with 2018 Bowman. It's hard to be disappointed with a purchase made only to get me to a five dollar minimum, but it wasn't particularly notable. Honestly, I kinda wish that I'd had some spare change in my pocket to save myself the waste. On the bright side, I did finally get around to trying some new product and, most importantly, did track down a needed new name for my CATRC binder. While I may be having a truly difficult time keeping up on both fronts and feel like I'm trying to catch The Freeze, these were both certainly positive developments that I should focus on. Of course, I'm sure the Cubs will announce another flurry of roster moves ahead of the upcoming Crosstown Classic, just to screw with me. So goes the roster jenga life! I follow the MLB transactions page. I think the Cubs, Dodgers and Brewers are in the lead. Good luck keeping up! I'm with you on the shipping thing. I appreciate a well-packaged item, and I know shipping isn't cheap. But you can mail a toploader in a PWE for a stamp, and I'd be okay with that. Of course, I don't buy super high-end cards, so maybe that's it. It's a no frills website but you pay actual shipping and about $2 a card for newer releases. My Campana order was shipped in 3 PWE's which was cheaper than the multi-ounce rate and what I paid reflected that. You should be able to knock out multiples.